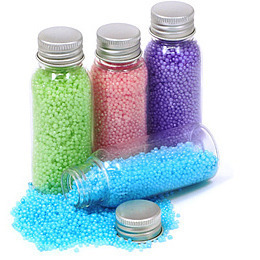 Pearlescent bath beads (bath caviar). Transparent, recyclable PET bottle with stylish aluminium cap. Contains approx 50 grams. Fragrances/Colours: strawberry (pink), lavender (purple), frangipani (yellow), berry (blue), vanilla (white), green tea (green), orange (orange).